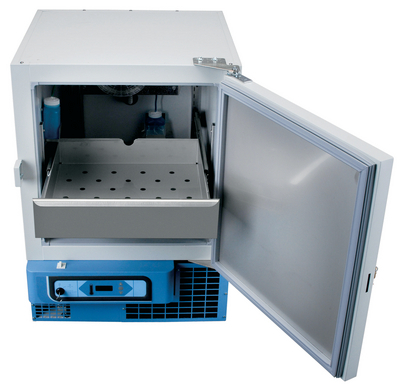 These freezers are designed to meet AABB, ANRC and FDA standards for safety and performance in plasma storage. Five models are available with different cabinet sizes to meet a variety of space needs and storage volume requirements. Automatic condensate removal and defrost, with sensor that automatically initiates defrost cycle on demand, eliminating need for a defrost timer, minimizing frost build-up and optimising coil efficiency. Bestelinformatie: Alarm systems, temperature chart recorders and power monitors are available separately. The additional voltages options are also available on request. Leveringsinformatie: Space-saver and upright models come with a 6˝ (15.2 cm) seven-day circular chart temperature recorder (optional free-standing on undercounter model) and extra-long probe for manual alarm testing.